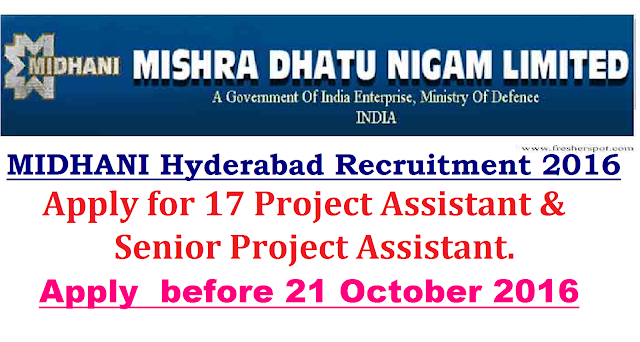 Mishra Dhatu Nigam Limited MIDHANI Recruitment 2016|Mishra Dhatu Nigam Limited invites application for the post of 17 Project Assistant & Senior Project Assistant. Apply before 21 October 2016 . For Project Assistant : SSC or Diploma in Metallurgical/Mechanical Engineering with certified ASNT/ISNT Level-II in RT/UT /MPI/LP with 3yrs relevant experience or Boiler Attendant- SSC/ITI with class-II Boiler Attendant Certificate with 3yrs relevant experience. For Senior Project Assistant : Diploma in Electrical/Mechanical Engineering/ EEE with 3yrs relevant experience or B Tech(Civil) with 3 yrs experience in construction and maintenance of residential/ Industrial Structure, Roads, Sanitary work etc. How to Apply MIDHANI Vacancy : Interested candidates may Apply in Plain Paper along with relevant document send to Addl. Genl. 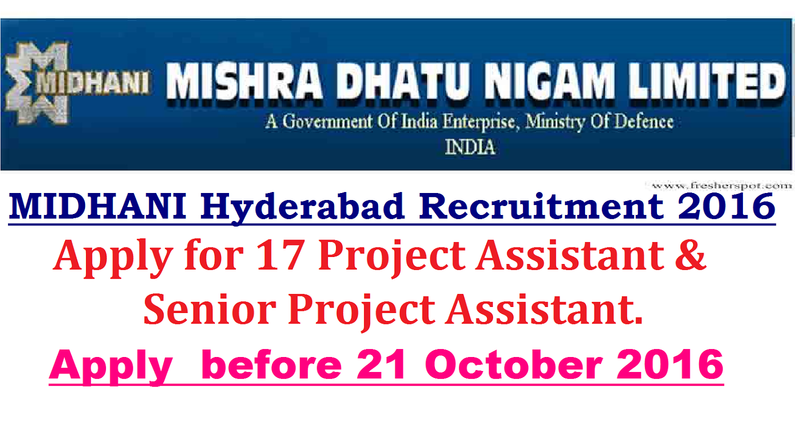 Manager (HR), Mishra Dhatu Nigam Limited, Regd. Office: P.O. Kanchanbagh, Hyderabad-500058 on or before 21.10.2016.